Wow, I wish. I’ve been asked this exact question at least 10 times, and I admit we were aiming for something along those lines. When push came to shove, though, we couldn’t find a way to divine the relative atomic weights of a One-on-One or a Decision Making Meeting. This chart isn’t quite that orderly. That said, there are a few organizing principles at work here. I’m going to explain the patterns in the chart with this caveat: there’s room for improvement, the chart will probably change in the future, and your advice on the matter would be most appreciated. The rows group meetings with similar design characteristics. All the meetings in a row share a common perspective on the organization’s work and involve people in similar ways. In the original post, these were the three major subgroups in the taxonomy. These meetings involve existing groups executing on known work. They maintain and shape the organization’s current state. These meetings reveal the organization’s reality. A solid circle to represent a stable connection between participants, and the cog wheel of time, to represent known work. Note: I’ve also been told the icons blow chunks. Designer friends, I’m open to your better ideas! 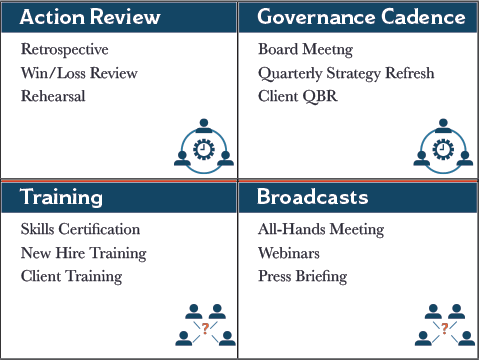 Most Cadence meetings involve some form of information sharing, problem solving, and decision making; the traditional break-down of meeting types. But these are NOT dedicated decision making meetings (for example). Psychologically, these meetings struggle to balance accountability and camaraderie. Because the Cadence meetings must balance accountability and camaraderie, and because they often have multiple desired outcomes (updates, decisions, etc. ), they’re harder to run well. To succeed, these meetings need the right timing and framing. The language used to name these meetings matters a lot. These meetings seek to create change in the organization. What happens in these meetings reveals who the organization thinks it should be. A dashed circle to represent an impermanent connection between participants, with the light bulb of inspiration at the center. A meeting dedicated entirely to solving a problem or making a decision elevates the importance of those decisions. Because these are special events, it becomes possible to use techniques that lead to better outcomes but would be awkward in a Cadence meeting. To succeed, these meetings need the right structure. Psychologically, these meetings struggle to balance several competing values. Do we push towards increased stability or embrace change? How do we get to an answer that’s “Good” and “Done”? There’s a tension between getting the best result and reaching a result that can quickly be put to use. These meetings seek to learn, understand and influence the organization’s context. These meetings reveal the organization’s values. People on opposite sides, meeting from different perspectives on a common question. To succeed, these meetings need to be approached with the right mindset. Psychologically, these meetings struggle to balance openness and confidence. True learning and negotiation requires an admission of ignorance that’s hard to balance with the need to impress and control. Moving from the left to the right of the chart, the heading colors shift from a lighter blue to a darker blue. A handful of the meetings have red headings. The colors convey the emotional tenor common to those kinds of meetings. The lighter blue meetings tend to be congenial. Relatively friendly and non-threatening. The darker blue meetings tend to be more formal. They may still be friendly, but they require more social effort. By way of example (and a bit of oversharing) my husband and I enjoy swashbuckling and salty language, and sometimes a bit of that spirit leaks out when we’re in a light-blue meeting. For the dark blue meetings, we stow our pirate selves below decks. The red meetings can be intense. These are often meetings with high-stakes outcomes and include what the social scientists call “high-stakes social evaluations”; too heavy on the cortisol to be healthy every day fare. 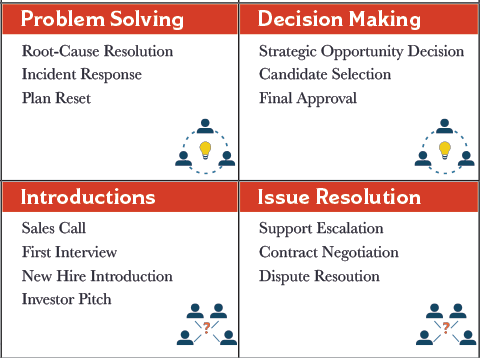 One final layer: you can get a feel for an organization’s scope and performance maturity by counting which kind of meetings they run and seeing how clearly they recognize the distinctions between these meetings. Very young/immature organizations “just meet”. Mature organizations develop and refine structures to improve outcomes in each scenario. Here the pattern isn’t as clean, unfortunately. I was hoping to come up with something that worked like a game of meeting performance maturity bingo; mark off all the meetings in a section and you are a maturity level 3 winner! It didn’t work out that way. Instead, it looks more like this. 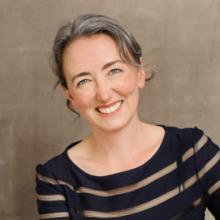 As organizations grow and mature, they run more distinct meetings. 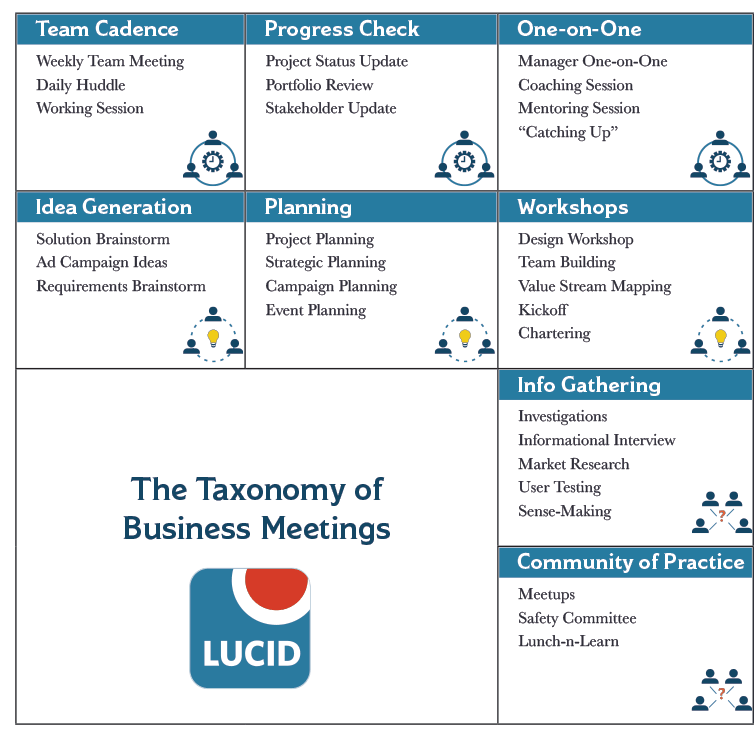 Most organizations run the meetings in the top-left corner (team cadence, progress checks, etc. ), and introductions. As an organization gets bigger and more complicated, they start adding more kinds of meetings. 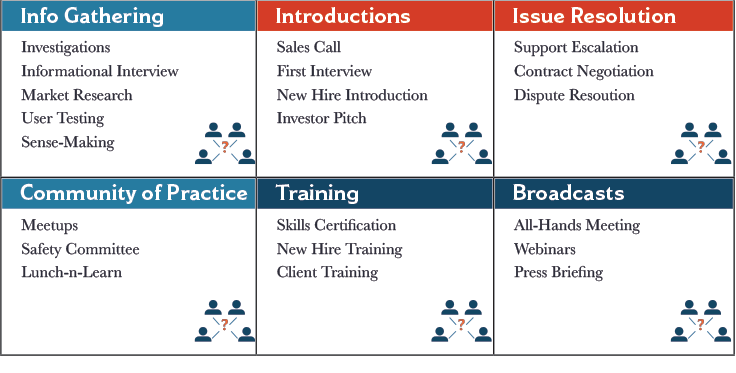 For example, one-on-ones don’t become “a thing” the organization does until they have a management layer. Once you get to that 10-20+ size, though, other kinds of meetings become inevitable. This doesn’t mean that they run all these meetings well, or with clear intention. It’s very possible to run many different kinds of meetings with Level 2 maturity. More mature organizations have processes for most of the different meeting types and they treat each as specialized meetings. 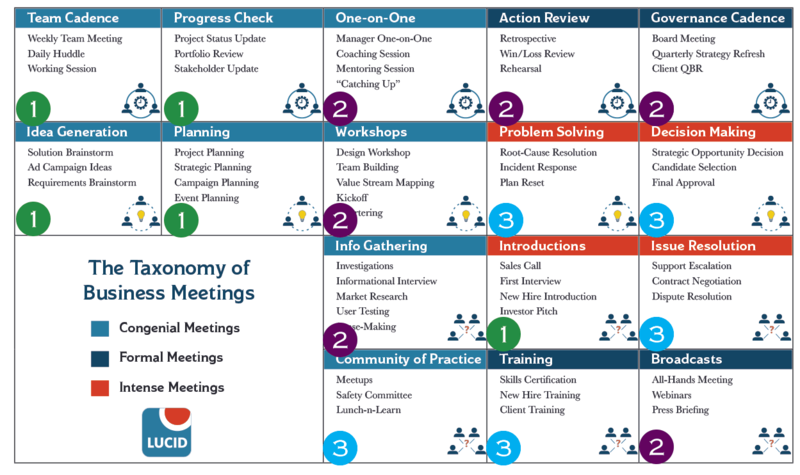 If you schedule a problem solving or community of practice meeting, and you KNOW that you’re doing that, there’s a good chance you’ve taken some time to figure out how to make that kind of discussion work. If you run a decision making meeting, and the people you invite know what to expect from a dedicated decision-making meeting, you’re operating at a higher level of meeting performance maturity than most organizations. 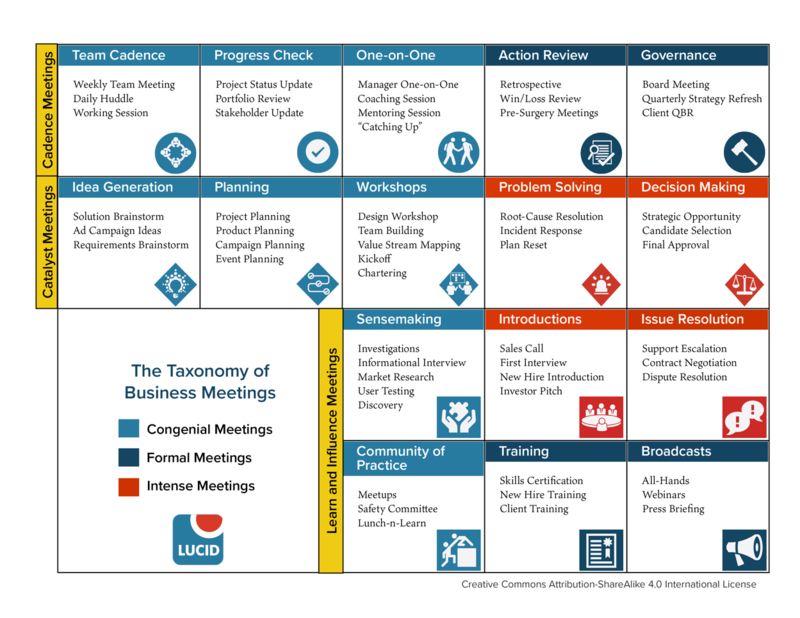 By contrast, less mature organizations try to get the outcomes of a problem solving or community of practice meeting in a regularly scheduled Cadence meeting. Or by just “meeting about that thing”. This isn’t particularly effective. Shrek: For your information, there's a lot more to ogres (Meetings!) than people think. Shrek: Example... uh... ogres (and MEETINGS!) are like onions! Shrek: NO! Layers. Onions have layers. Ogres (Meetings!) have layers... You get it? We both have layers. Shrek: I don't care what everyone likes! Ogres/meetings are not like cakes. Donkey: You know what ELSE everybody likes? Parfaits! Have you ever met a person, you say, "Let's get some parfait," they say, "Hell no, I don't like no parfait."? Parfaits are delicious! Shrek: NO! You dense, irritating, miniature beast of burden! Ogres and meetings are like onions! End of story! Bye-bye! See ya later. Donkey: Parfaits may be the most delicious thing on the whole damn planet! You know what? I have a 5-year-old daughter who will put all the extra onions on her plate, because I know how to cook an onion so it tastes like candy. Maybe not quite as tasty as parfait, but pretty darn tasty. Meetings are like onions. There are layers to this stuff, and if you don’t treat it right, you will make people cry. And yet, if you cook at all, you know there are onions in everything. Just like every single organization is full of meetings. We’ll keep peeling back these layers to figure out how to help everyone turn all the crying over meetings into frizzled shallots and bloomin’ onion awesomeness. Please share your ideas, techniques, and feedback in the comments below.